Each month, we’ll go inside the kitchen and bring you one of Chef Ken Dempsey’s personal recipes! 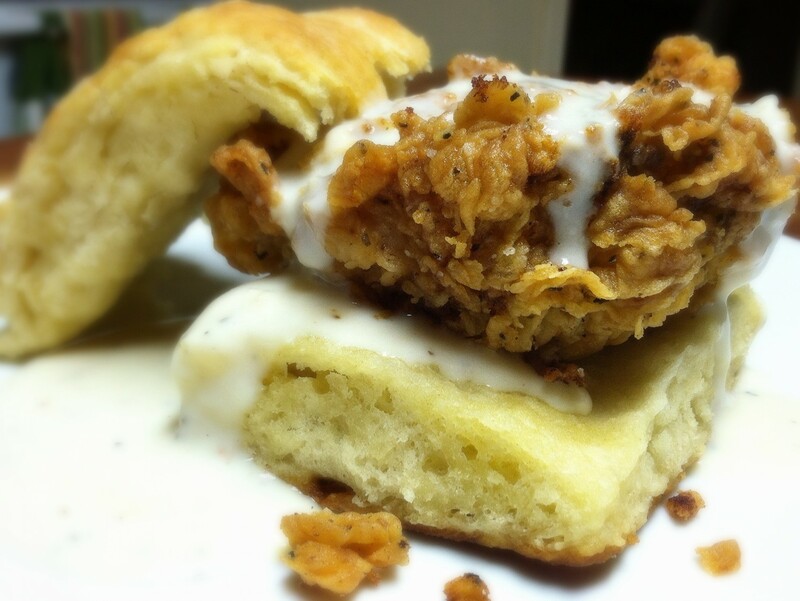 Buttermilk biscuits and fried chicken is a cold winter day’s best friend, and nobody made better biscuits than my Grandma Faye. One of the best things I learned from her is that you never need more than a few bucks, love for great scratch food, and a little patience to feed a family. We actually lived in the same trailer park when I was a young boy and I would routinely walked over on Saturday mornings to her place. It took a few years for me to give in to the offers of biscuits, but when I did, I was hooked. It was amazing to me the same hands that spent long hours in factories to support her family were the ones that made the most perfectly soft, buttery biscuits I’ve ever eaten. Those biscuits were made with love, and you could tell it by the way they tasted, smelled, and felt. They were perfectly soft and fluffy on the inside with a slight crispiness on the exterior. You could taste the creamy, fresh butter and subtle tartness from the buttermilk in every single bite. As an adult, I’ve been chasing her biscuits, trying my best to perfect Grandma’s Saturday morning recipe. The only thing missing is her hands, but the same love she shared with me is there. I just added some buttermilk fried chicken thighs! 1. Preheat your oven to 425°F. 2. Combine the first four ingredients in a large bowl and mix with your hand. 4. Add the buttermilk and quickly mix with hands until barely combined. 5. If it appears to be dry add a little more buttermilk (dough should be a little wet). 6. Place the dough onto an already floured countertop. You may need to re-flour to prevent the dough from sticking to the counter. 7. Gently roll the dough with a rolling pin until ½ inch thick, then fold over in half. Your biscuit dough should now be about 1 inch thick. 8. Form your dough sheet so it resembles a square like shape. 9. Use a pizza cutter to cut into 8 large squares. Place biscuit dough squares into lightly greased baking pan. 10. Bake for about 13-18 minutes- the biscuits will be an awesome golden brown with a lightly crispy exterior and a tender and fluffy inside. 1. Combine chicken and buttermilk in a sealable bowl and set in refrigerator for at least two hours. 2. Heat the oil to 350 degrees in large pot for frying. 3. Combine the first five ingredients in a large bowl and mix well. 4. Press the buttermilk marinated chicken thighs into the flour mix on both sides of the chicken. 5. Re-dunk the floured chicken thigh into the buttermilk and press back into the flour mix one more time. Repeat this for all the chicken thighs. 6. Carefully place floured chicken thighs into hot oil and cook until breading is golden brown. The outside should be very crispy and inside completely done with an internal temp of 165 degrees. Ken is an award winning BBQer and chef. Currently he is the chef at Arkansas Surgical Hospital, previously Ken has worked with E's Bistro, Ristorante Capeo, and Maumelle Country Club.